Storm 110cc mini dirt bike available only from MiniBikes.Store. Perfect starting bike for kids age from 8 years old up to 15 years old. Easy to maintain and hassle free 4 stroke engine, 4 gears manual gearbox and kick start make Storm 110cc dirt bike perfect first bike. - Low price for such good quality! Video of Krystian from MX Banda riding the brand new Storm 110cc Pit Bike from Nitro motors on the motocross track. Hard test of our new 110cc Semi Automatic Cross on the motorcross track. Step by step Instructions how to start the 110cc Pit Bike Storm for the first time. The video will explain how to prepare the 110cc Cross Storm from Nitro Motors for the first start. Video step by step how to properly assemble 110cc and 125cc Pit Bike Storm V2 from Nitro Motors. Video will also show you what is in the box, how to get the bike ready for first start, how to regulate chain and instal wheel and brakes on your new 110cc 125ccm Pit/Dirt Bike Cross Storm V2 from Nitro Motors. Full instructions how to start for the first time 110ccm Pit Bike, Dirt Bike Storm 110cc from Nitro Motors (Germany). This video will explaind you what you need to do step by step to start your Pit Bike 110ccm. 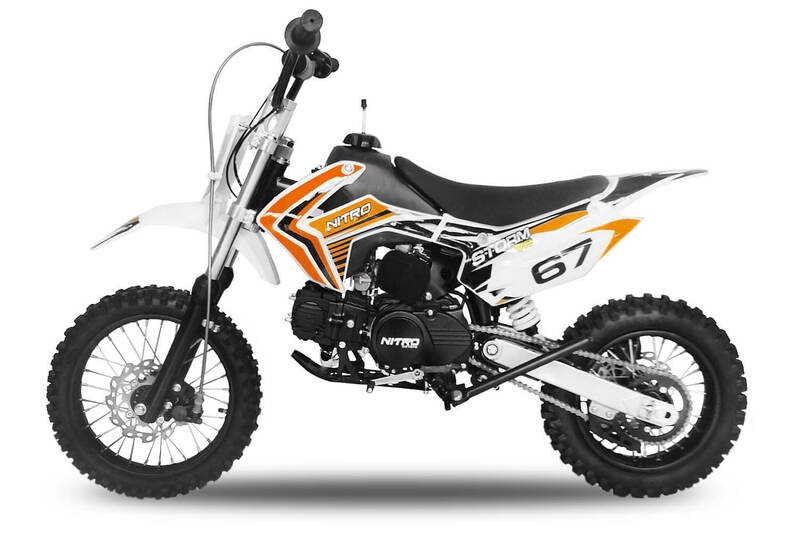 Quick video of new 110cc Pit Bike from Nitro Motors (Germany). The Storm 110cc, 4 stroke engine, fully automatic, electric start, hydraulic disc brakes... and very high quality frame is one of the best 110cc Pit Bikes on th market.